Cap and trade - an effective policy to address climate change? The presentation will focus on the design of market based solutions to mitigate greenhouse gas emissions and will emphasize the advantages and experiences of Cap-and-trade as a climate change policy instrument. Point Carbon is a world-leading provider of independent news, analysis and consulting services for European and global power, gas and carbon markets. Point Carbon’s comprehensive services provide professionals with market-moving information through monitoring fundamental information, key market players and business and policy developments. California – often a bellwether of regulations to come - passed AB 1879 (Feuer) and SB 509 (Simitian) in 2008, setting in place some recommendations of California’s Green Chemistry Initiative. There are discussions of reauthorizing the Toxic Substances Control Act (TSCA), incorporating some practices of the European Union’s REACH (Registration, Evaluation, Authorization of Chemicals). This presentation will cover California’s Green Chemistry initiative, new and proposed regulatory requirements. This talk will examine the pervasive nature of the current explosion in environment/sustainability laws; innovative (but little understood) legal, commercial and technical principles embedded in the newest laws; the rise of clean technology; direct and indirect impacts on mature commercial sectors and the professions; the dangers of short term and narrowly focused thinking; the scope of opportunities and the latency of risk. Paul Sheridan, Partner, is head of the environment law group of CMS Cameron McKenna LLP. He also heads up the firm’s cleantech group. This group is objectively recognised as one of the leading environment law practices in the UK and EU. Paul is recognised in the legal directories as a leader in this field in the UK, EU and Internationally. He has advised numerous domestic and multi-national clients on all aspects of environment law in both contentious and non-contentious matters. He is well versed on the latent and patent impacts of, and enormous opportunities arising from, the current and pervasive phase of environment laws which is leading towards fundamental changes in the way we do business. As cap-and-trade legislation is working its way through the U.S. Congress, maintaining the legislation's underlying environmental credibility while mitigating unreasonable economic hardships will be essential for a successful outcome. The use of offsets (i.e., project based greenhouse gas emission reductions from non-capped sources) will play a central role in achieving these dual objectives as part of the overall legislative scheme. You will hear details of how offsets are contemplated to be used within the U.S. legislative scheme; explore their history and future in international climate change policy; and how they are likely to effect your business and industry. According to the foreword to a recent report by the Environmental Defense Fund, “regulating the temperature of the planet by adjusting the mix of gases in our atmosphere is the most ambitious undertaking yet attempted by human beings,” and the effects of this effort on many companies “will be profound.” Many public bodies are preparing “adaptation plans” for a reasonable worst case climate change scenario, but private businesses have lagged behind. Even if one does not believe that CO2 and temperature are inextricably linked, businesses will need to adapt to the coming changes in regulation, and possibly to the effects of climate change itself. This program will discuss the challenges that private companies face in adapting to climate change, including physical exposure, changing prices for energy, water and other inputs, as well as regulatory, reputational, and litigation exposures. The program will then outline steps that some leading companies can take to plan for and address these challenges and to identify strategic and market opportunities. E. Donald Elliott is a partner and chair of the Environment, Health and Safety Department of Willkie Farr & Gallagher LLP. He is also Professor (Adjunct) of Law, Yale Law School and Georgetown University Law Center. He is the leading expert in private practice on disclosure and adaptation to climate change issues. Elliott was Assistant Administrator and General Counsel, U.S. Environmental Protection Agency during the Clean Air Act Amendments of 1990. Mr. Elliott holds degrees from Yale College and Yale Law School. Ari G. Altman is an Associate in the Environment, Health and Safety Department of Willkie Farr & Gallagher LLP. Mr. Altman received a J.D. from The George Washington University Law School, an M.A. in Energy and Resources from the University of California, Berkeley, and an A.B. from Princeton University. This is primarily a policy-focused program examining the costs of a cap and trade program and the problems with these programs. State and national legislation to address climate change is significantly altering the land use patterns in our nation's cities and rural areas. This talk will cover some of the major shifts that climate change legislation will have on the type of development that will be permitted and/or encouraged and will also touch on the new procedures and hurdles that landowners and developers will likely encounter in seeking project approval. Examples will be given from the implementation California's recent legislation, and we will also examine initiatives in other states and predict how the upcoming national effort could further impact the landscape. California has taken the lead on Climate Change policies with the Global Warming Solutions Act of 2006. This Air Resources Board recently published its blue print with a dizzying array of forthcoming policies and regulations that will influence state and federal laws and policies on Climate Change for years to come. This talk will address these regulatory strategies which range from alternative energy, industrial emissions, green building, and mandatory carbon inventories. Trends and Developments in Environmental and Climate Change Law. 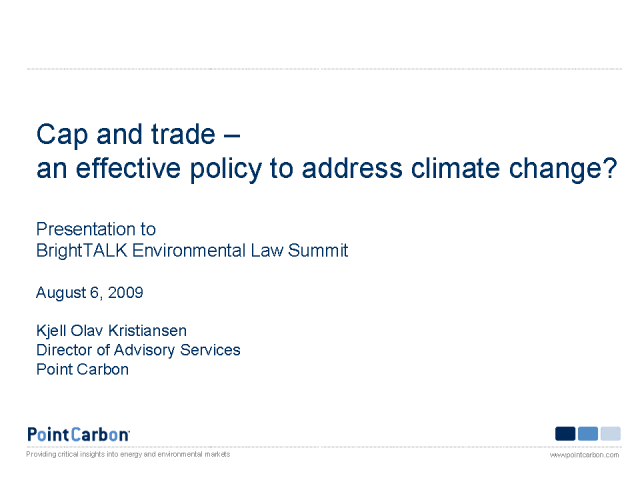 Title: Cap and trade - an effective policy to address climate change?